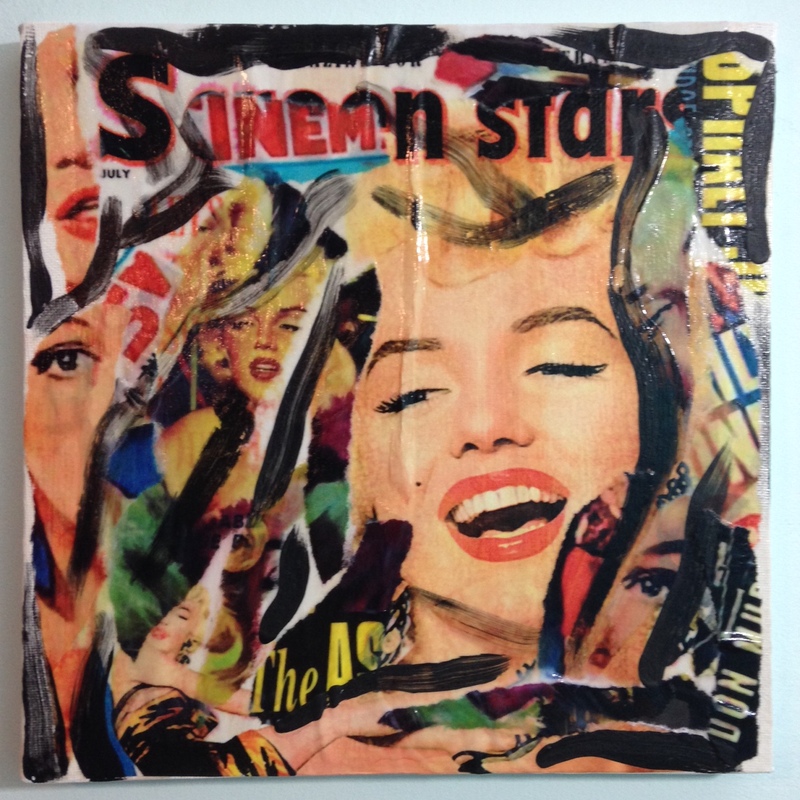 It’s Day 238 and I had a bit of a hectic day so I decided to do something fun and maybe quick…a décollage! Please join me in honoring Mimmo Rotella today! 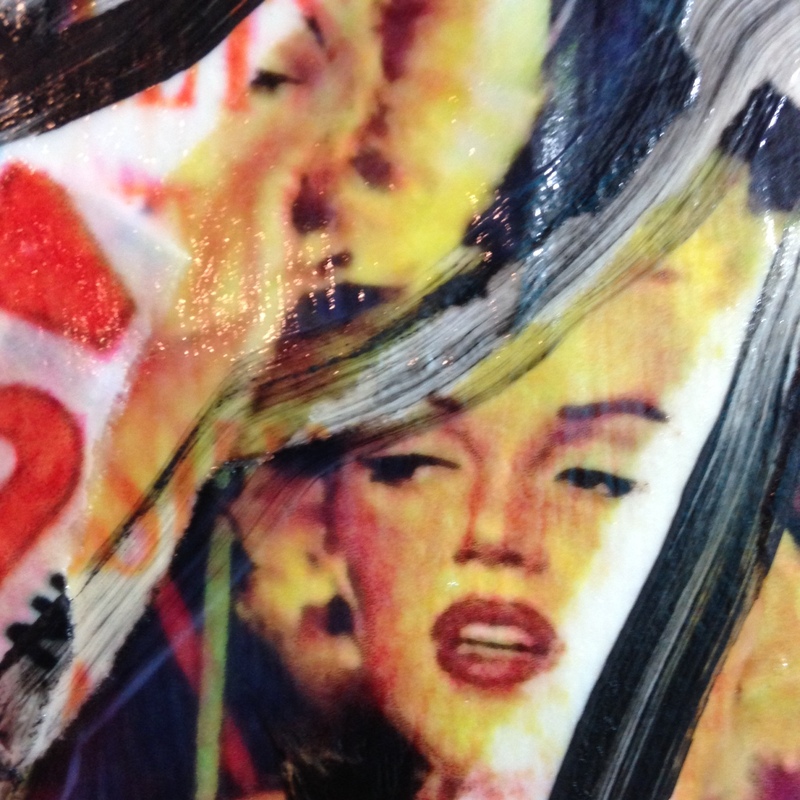 Mimmo Rotella was born in Catanzaro on the 7th of October 1918, the son of a milliner. Following high school he moved to Naples where he began art studies (in 1941 he went to Rome after having obtained a post at the Ministry of Postal and Telecommunication Services). He did not stay long in the capital, however: on being called up he joined the course in the Officer-training School in Nocera. From here he was sent to the School for Non-commissioned Officers in Caserta (Campania). In 1944 he left the armed forces and then obtained his diploma at the Naples Art Academy. From 1944 until 1945 he taught draftsmanship at his city’s Institute for Surveyors. In 1945 he moved to Rome: following his figurative beginnings and first experimentations he elaborated a manner of pictorial expression of neo-geometrical matrix. His participation in exhibitions began in 1947 at the Mostra Sindacale di Arti Figurative. He also took part in all the annual exhibitions of the Art Club up until 1951, both in Rome and Turin. As an alternative expressive method 1949 saw him invent phonetic poetry which the artist called ‘epistaltic’ (a neologism lacking sense): this was a collection of words (also invented ones), whistles, sounds, numbers and onomatopoeic reiterate. In the same year he wrote its Manifesto which in 1955 was published by Leonardo Sinisgalli in “Civiltà delle Macchine”. His first one-man exhibition, with abstract-geometrical works, was held in 1951 at the Galleria Chiurazzi in Rome (an exhibition which enjoyed little favour on the part of criticism). 1951-1952 he obtained a scholarship on the part of the Fullbright Foundation, thanks to which he was able to sojourn in the United States at the University of Kansas City with the appointment as Artist in Residence. Here he created a large mural composition and recorded phonetic poems with the accompaniment of percussion instruments. At Harvard University in Boston he held a performance of phonetic poetry and recorded other pieces for the Library of Congress in Washington. In 1952 he also held a second one-man exhibition at the Rockhill Nelson Gallery in Kansas City. His sojourn in the United States offered the possibility of getting to know the works of the protagonists of the new art currents: Rauschenberg, Oldenburg, Twombly, Pollock and Kline. Following his return to Rome in 1953 he experienced a drawn-out crisis during which he interrupted his pictorial production. Convinced that everything in art had already been done he improvised what he himself has defined as “Zen illumination”: in short, the discovery of the advertising poster as artistic expression, as the message of the city. 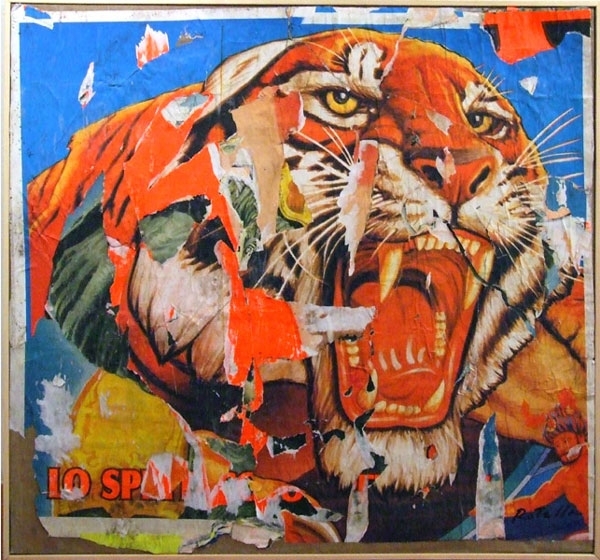 This saw the origin of the décollage – initially the collage – by way of glueing pieces of posters ripped off on the street onto canvas. 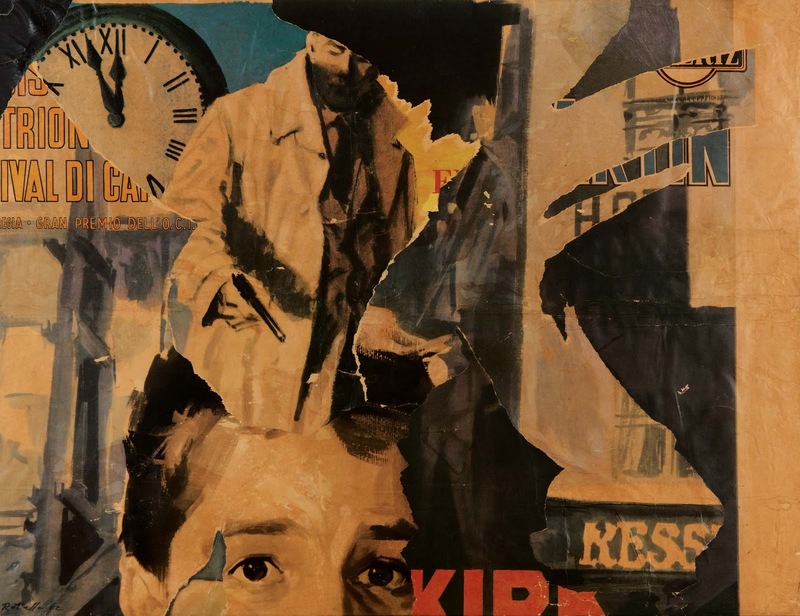 Here Rotella adopted the collage as used by the cubists, ‘contaminating’ it with the dadaist and desecrating matrix of the objet trouvé. 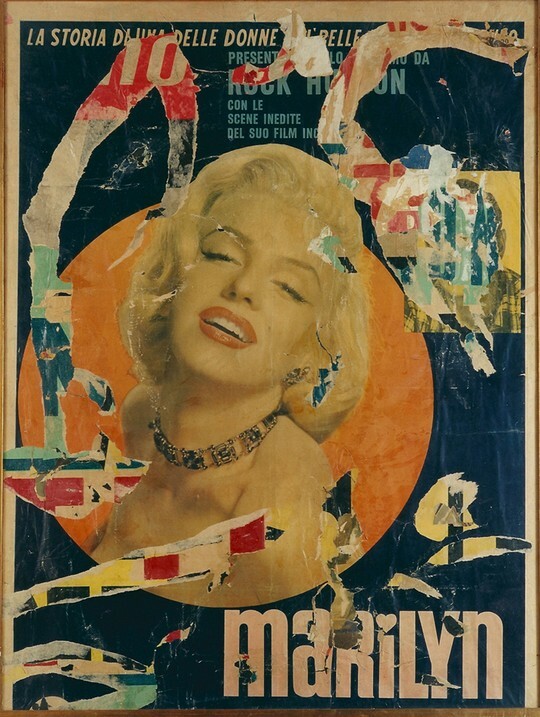 In Rome he showed the ‘torn poster’ for the first time in an exhibition entitled “Esposizione d’arte attuale” (1955). 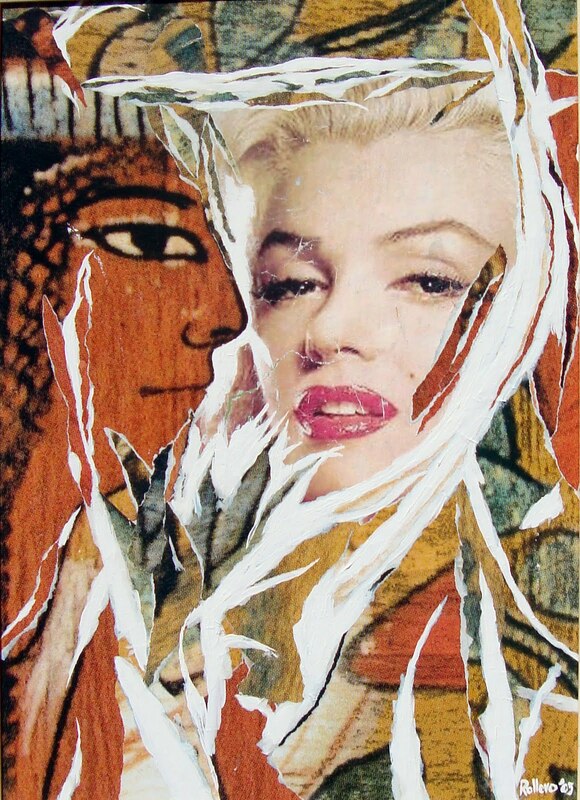 He carried out the so-called “double décollage”: that is, the poster firstly removed from the wall and then torn up in the studio. In this period he also made use of the retros d’affiche, using the verso of the posters with the result obtained of non-figurative and monochrome works. He began to receive acknowledgements in 1956 with the Graziano Award, followed in 1957 by the Battistoni e della Pubblica Istruzione Award. With the Cinecittà series of 1958 he chose both the figures and faces of film posters, orientating his production towards works of a more figurative type. Already recognized by criticism at the close of the 1950’s as being an exponent of the “Young Roman Painting, Rotella was labelled as the ‘poster ripper’ or the ‘painter of glued paper’. At night, armed with a penknife, he not only ripped off posters but also pieces of the metal sheeting and zinc of the mounting frames of the billboard zones of the Rome City Council. In 1958 he was visited in Rome by the French critic Pierre Restany, a meeting which was to lead to a long friendship. In the same year he was included in the Roman exhibition entitled “Nuove tendenze dell’arte italiana”, organized by Lionello Venturi and held in the seat of the Rome-New York Art Foundation. In 1959 one of his works was reproduced in the review “Azimuth”, founded in Milan by Enrico Castellani and Piero Manzoni. The curiosity on the part of the public for the artist’s extravagances, for a person who decidedly led a bohémien life, was crystallized in 1960 by way of a short film directed by Enzo Nasso dedicated to the Pittori arrabbiati [Angry Painters]. Here Rotella directed the ‘soundtrack’. Restany and included – amongst others – names like Klein, Tinguely, César, Spoerri, Arman and Christo. The group also included the French artists Hains, Villeglé and Dufrêne who in fact also worked on the collage, albeit in an autonomous way. By working in the most total isolation Rotella had anticipated the path of his French colleagues who were only exhibited for the first time in 1957 at the Galerie Colette Allendy in Paris. Together with his décollages Rotella also created assemblages of objects bought from junk dealers: bottle caps and stoppers, pieces of rope, twine etc. American Pop Art and Abstract Expressionism, together with the Informal and the spatial and matteric research works carried out in Italy at the time by Fontana and Burri, played an important role in directing Rotella’s pictorial orientation. In 1960 he met De Kooning and Rothko in Rome. In 1961 he took part in the historical Parisian exhibition entitled “A 40° au-dessus de Dada”, supervised by Pierre Restany. 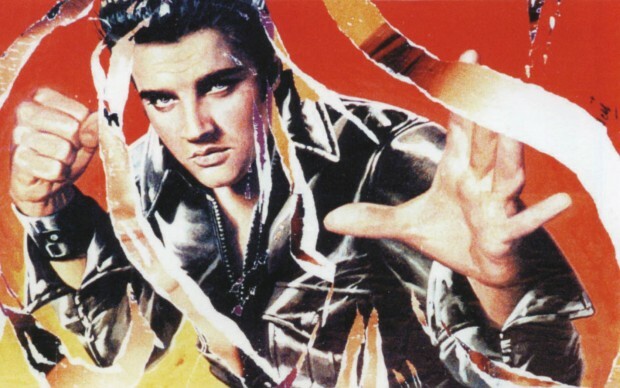 In 1962 he talked about his own artistic operations at the School of Visual Arts in New York. In 1964 he was invited to take part in the Venice Biennial. 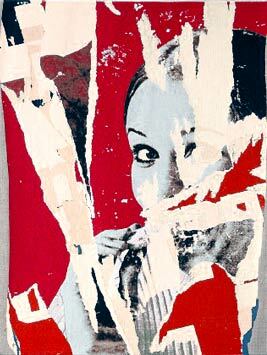 While the press increasingly more talked about the phenomenon of Affichisme Rotella moved to Paris where he began to elaborate a procedure of serial production by way of the projection of images in the negative on emulsified canvas. This operation was to be given the definition of Reportage by the artist or, and more specifically, Mec-Art in 1965 together with the art critic Otto Hanh and the painter Alain Jaquet. The same year saw his Parisian exhibition at the Galerie J. Using typographical products, between 1967 and 1973 he created his Art-typo works, printing proofs freely chosen and reproduced on canvas. With this procedure he amused himself in insetting and superimposing advertising images: «I inverted my old approach: first I tried to disintegrate, now I try to reintegrate that matter, that reality». At the beginning of the 1970’s he carried out a number of works by directly acting on the advertising pages of magazines with the use of solvents, reducing these either to the state of the imprint (frottage) or quite simply cancelling them (effaçage). Two years later, in 1972, he published an audacious autobiography titled “Autorotella”. The “Plastiforme” were created in 1975: ripped posters placed on a polyurethane support with the intention of giving them tridimensionality. In the same year he recorded his first Italian LP of phonetic poems, presented by Alfredo Todisco. In 1976 he took part in the International Recital of Sound Poetry – Poetry Action at the Atelier Annick Le Moine. Another experimentation carried out in those years was that of rolling up posters and closing them in plexiglass cubes. zeroed advertising posters covered with white sheets of paper – as happens for posters that are replaced or have finished their billboard lease – following a conceptual operation. 1984 saw him once again using brushes and acrylic colours in order to create the second cycle of works dedicated to the cinema: Cinecittà 2. In 1986 he visited Cuba, exhibiting his works at the Havana University. 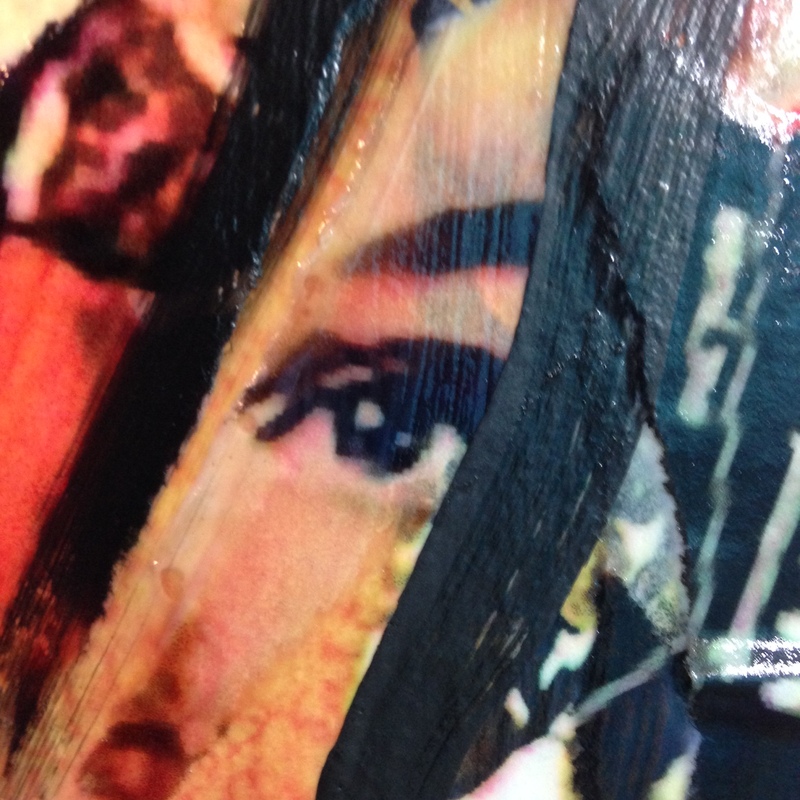 During his stay he also took part in a performance: the laceration of posters in the Square of the city. During the same year he held a series of talks at the Domus Academy in Milan. 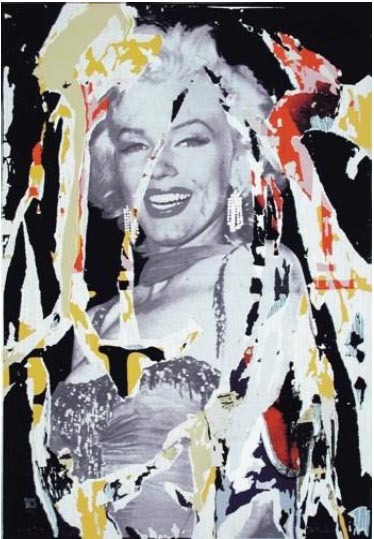 He then created his sovrapitture (overpaintings), inspired by the up-to-date theme of graffiti, pictorially intervening on the advertising posters that were torn and then glued on canvas (and from 1987 also ripped posters glued on a support of sheet metal). He drew anonymous writings, like the ones it is possible to read on city walls: signs, love notes and political slogans/epithets in a double message. In 1990 he took part in the “Art et Pub” exhibition held at the Centre Pompidou in Paris and in the “High and Low” exhibition held in New York at the Museum of Modern Art. In 1991 he married the young Russian economist, Inna Agarounova, who in 1993 gave birth to Asya. In 1992 he was conferred the title of Officiel des arts et des Lettres by the French Minister of Culture, Jack Lang. New York. In 1996 he took part in “Face … l’Histoire” at the Centre Pompidou and in the exhibition entitled “Halls of Mirrors” held at the Museum of Contemporary Art in Los Angeles (an exhibition that was to tour the world, Rome included). 1996 also saw the Internet inauguration of a one-man exhibition which was diffused online – the first event of its kind in Italy. In 1997 Rotella dedicated the cycle of works entitled “Felliniana” to the films by Federico Fellini. In 1999 the Mayor of his natal city, Sergio Abramo, signed a City Council order authorizing Rotella to freely remove posters in Catanzaro and its environs. Biography above is from Ro Gallery’s website. 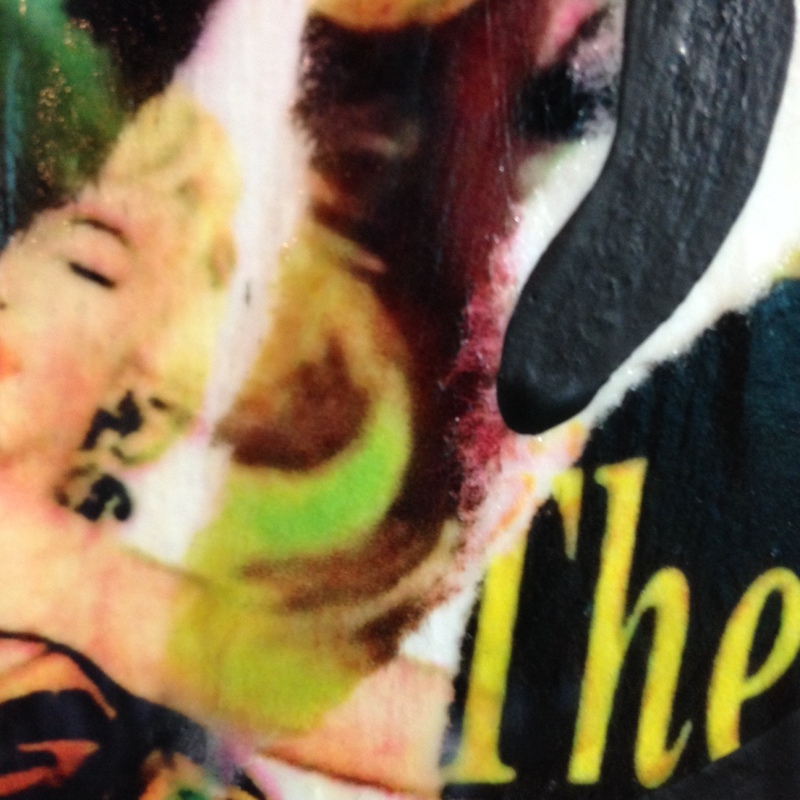 I decided to use Marilyn Monroe movie posters for my piece today since after researching the artist I noticed he used her a lot. I really enjoyed creating today’s piece. 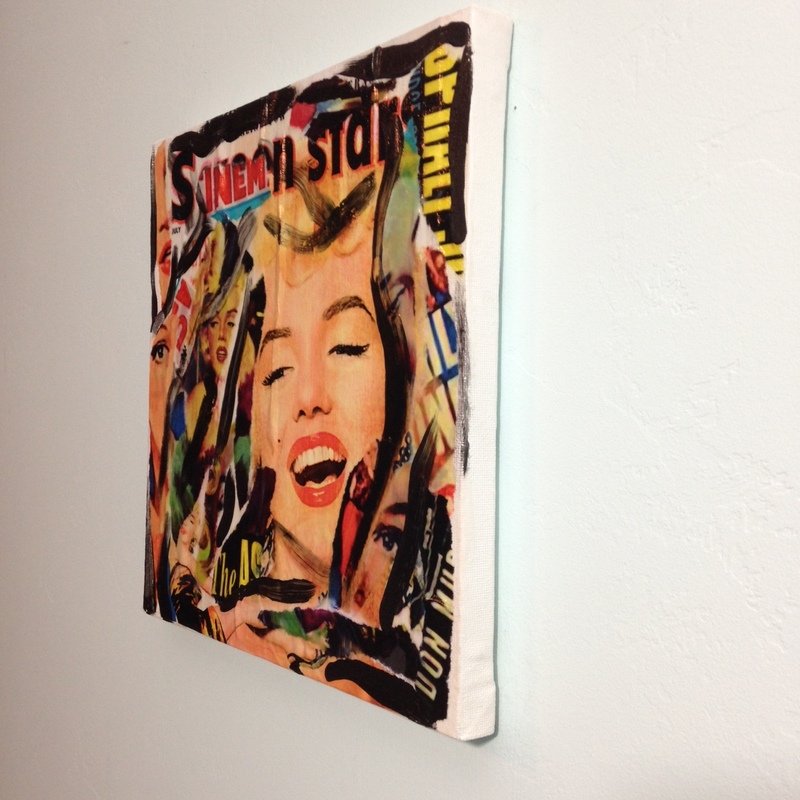 There was something very relaxing about ripping the paper and adhering it in patterns on the canvas. I hope you enjoy my piece today and I’ll see you tomorrow on Day 239!